One of the principles RETAL works on is to promptly respond to the market requests for PET packaging. Likewise, an upward trend in the global restaurant industry - the use of modern disposable PET-containers of large volumes – was not neglected. RETAL has started production of preforms for blowing the disposable PET kegs for tanks of 20 and 30 liters. The increasing popularity of this type of packaging throughout the world is quite explainable and well deserved. A disposable plastic keg is suitable for use in the most common filling systems of Pegas. It is convenient for transportation of beer, kvass (effervescing drink made of water, berries, fruits, or honey), lemonades and low-alcohol cocktails, and has a number of undeniable advantages. In this way, a disposable PET keg, while meeting all the necessary environmental and safety standards, is much lighter and more economical. Its use excludes a whole chain of costly stages in the turnover of containers, such as their return, washing and storage. The development of this promising market segment has started for RETAL within the production facilities of its Russian enterprise, with especial care for the quality of components for this new type of products and a smooth distribution. The partner for the project and the supplier of fittings for PET kegs in Russian market is PET-Expert company. RETAL products differentiation in form of PET kegs strengthens its position significantly in the beer segment. For the business of established customers of RETAL, the new producer proposal also offers excellent opportunities for development. High quality of products and their innovative advantages are able to ensure a consistently high demand in this market from the side of regular partners, and helps attract new customers. 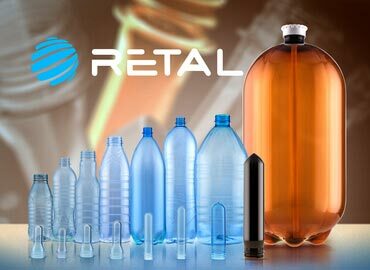 RETAL intends to promptly roll out and advance the successful experience - PET preforms for 20 and 30-liter disposable kegs are planned to be produced at other sites of countries of operation in the nearest future.